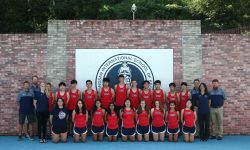 At the beginning of the XC season, the cross country had hopes of slight improvements of teams that the coaches supposed were largely composed of the same individuals on both the boys and girls squads. Last year these teams finished what all would agree were disappointing fifth place finishes in the KAIAC meets. But, this year, something happened that changed everything: both the boys and the girls came in with an exceptional will to work and to reach their potential. That will characterized each difficult workout that the runners had through the year. There was no complaining, and the captains led well. The girls came in missing their number one runner from the previous two seasons. At the end of the season, only three returning runners were contributing as varsity team members. That means two things: (1) three new freshmen runners had come out to shake things up, and (2) the returnees were pushed by the new girls to perform at a much higher level if they wanted to remain a part of the varsity team. This year, Jamie Lee’s awesome move from participant to athlete really made the difference for the girls. All of the returnees ran monster PRs, and all of the new varsity girls stepped up to meet the challenges of contributing at the highest level. These girls improved two spots from 2010 to finish third in KAIAC. They clearly worked hard to give their best for one another. None could bear to be the weak link. As the teams moves away from the 2011 season, they lose a school record holder (Roland Umoru), a four-year letterman who has run third on the team for years (Lester Choi), and their fastest girl (Kimmie Casto), but if they continue to improve at the rate they did all season, they should remain at the top of the KAIAC teams for years to come.